Oh, this book is a fun read. It's short, but fun. 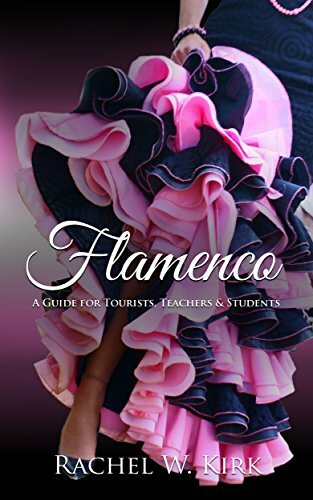 It is for anyone interested in Flamenco and how it evolved, more than just tourists, teachers, and students the title implies. Here is a book description by the author: This short e-book includes a thorough yet concise introduction to the Spanish art that includes song, dance, and guitar. It informs the reader about the origins and evolution of the art in Andalucía, and about each of the three elements of flamenco. Readers learn what to expect at a flamenco show, as well as what to look and listen for in order to more fully appreciate the performers on stage and the art of flamenco itself. I had originally intended to include only one of Rachel Kirk's books, because you'll be able to find the rest of her books when you get to Amazon. But her response to my query about this particular title made me decide to include it. "50 Keys" is hot off the press. It is mainly for students who get behind in their Spanish class and/or need additional help, but it's also great for students in the growing number of states where there is just a "classroom set" of textbooks, which means students are not allowed to take their textbooks home. In other words, it is for people who are studying Spanish and need a resource that explains the concepts. So if you think your readers or their kids would find it helpful, it might be a nice option. The long-awaited resource for students of Spanish has finally arrived! 50 Keys to Spanish is the amigo to all students of Spanish. Like a private tutor, 50 Keys includes clear explanations and examples that will help pave the way for student success at all levels of Spanish. This concise volume includes only the information you really need to earn better grades in your Spanish class, presented in the order in which the concepts are generally taught. 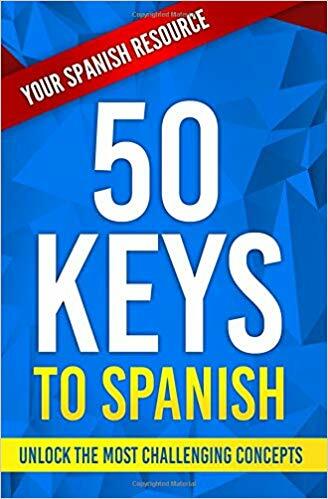 50 Keys to Spanish is the amigo you have been seeking if you… • need help understanding the concepts taught in your Spanish class • need a supplement to your Spanish textbook or class • want to catch up or earn better grades • love Spanish and want to work ahead • want to review or brush up on basic concepts • want a clear, concise Spanish language reference • still have questions you always wondered about Spanish This book covers the 50 most challenging concepts. For example: • Feminine and masculine nouns • Spelling and accent marks • Noun/adjective agreement • Usted and tú • Verb conjugations • Preterit(e) and imperfect • Por and Para • Subjunctive • Why is it el agua if it’s feminine? The author has a Ph.D. in the Spanish language and how to teach it. She has patiently and successfully taught Spanish to students of all ages and levels.